Review: Lady Bette and the Murder of Mister Thynn by N.A. Pickford. In an age when women – no matter how high born – had few rights, wealthy heiresses found themselves sometimes to be both bargaining counters of their guardians and targets for kidnappers after rich pickings. Lady Bette was one such, but so much more than that: she was a Percy and the heiress to the Northumberland estates: the very top echelon of the English aristocracy. Think Syon House in Brentford and Alnwick Castle in Northumberland, both still with us. Add to this the magnificent Northumberland House near Charing Cross – lost to the railways and urban expansion of the late 19C; and Petworth House and it’s clear that in the late Seventeenth Century, the Percys of Northumberland were an ancient and noble family of the first rank. They still are today. So when Bette’s father, the 11 Duke of Northumberland died in 1670 when she was just three, and her elder brother himself having died two years previously, little Bette became the heiress to vast estates. She instantly became a pawn in a marriage game played by two deadly rivals: her mother and her grandmother, the formidable Dowager Lady Howard. Having already lost her childhood husband from her initial arranged marriage (they appeared to be a fondly devoted young couple), Bette – still in her early teens – was fixed up with Thomas Thynn, an unpleasant character who rubbed shoulders with the emerging Whig faction surrounding the Duke of Monmouth – desperate chancers as history would later prove. These years of scheming and intrigue – skillfully woven by the author in the narrative – culminate in the event of the title: a drive-by assassination of Thynn in his coach at the cross-roads of Pall Mall and Haymarket. The killers were a group of down-at-heel desperadoes in the pay of the mysterious Count Konigsmark and his right hand man, Christopher Vratz, fortune hunters and mercenaries to a man. London at this time was a haven for resting military types from the Continent, common soldiers now impoverished habitues of the capital’s less salubrious inns and ale houses. They were easy recruits for this mission. Apart from Bette herself, no one comes out of this story with any credit. Honour there is none. Everybody, high and low alike, is on the make. My favourite – and likely yours will be too – is Ralph Montagu, sometime ambassador to Paris and step-father of Bette, whose strategic womanising and scheming are utterly shameless, leading ultimately to his disgrace at Court. A morality tale within a tale. N.A. Pickford weaves complex threads together with great skill and tells this amazing story with panache and style. His research is clearly both deep and wide-ranging and he manages his sources masterfully. Any history lover will enjoy this pacy true story, but if you’re particularly into the scheming, the intrigues, the power-broking of the Restoration elite, you will adore this book. The footnotes, references and index are excellent: all you would want. 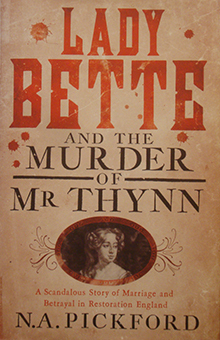 Lady Bette and the Murder of Mister Thynn (309pp) is published by Weidenfeld & Nicholson with a cover price of £20 although it is available for less.